Safes Galore offers the SG4350-EL drop safe with deposit chute on its webshop. 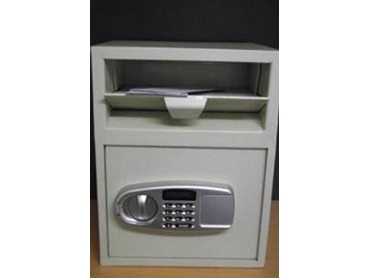 Ideal for retail shops, churches, events and sporting clubs, SG4350-EL drop safes allow staff to safely and quickly deposit daily collections in bulky envelopes or money bags into the lower safe. The SG4350-EL drop safes with deposit chute are built strong and feature 5mm thick extra frame strengthener plates in steel fitted on the door frame.